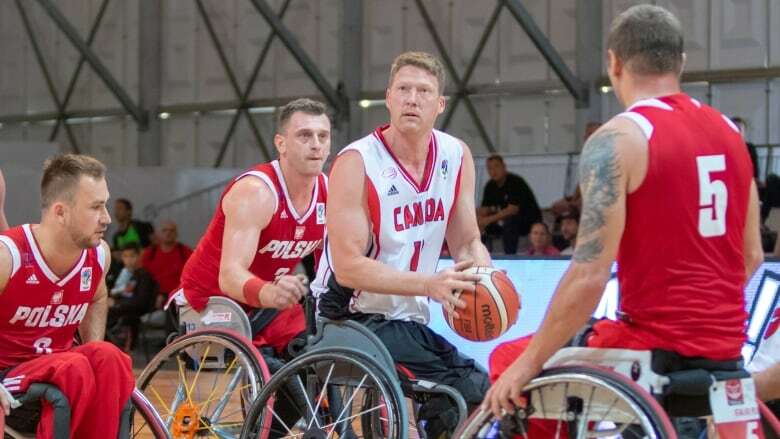 Canada was eliminated from medal contention in men's competition Tuesday at the 2018 world wheelchair basketball championships, while the women's team dropped a decision to the Netherlands in pool play. The men were eliminated with a 79-68 loss to Poland in the crossover game with a spot in the quarter-finals on the line. Poland shot 61 per cent from the field, and Canada had no answer on how to slow their opponent's offence enough to close the gap. "I'm very disappointed. They are good team and they shot very, very well and exploited their height advantage over us," said Patrick Anderson of Fergus, Ont., who had 19 points and 11 rebounds for Canada "We put enough points on the board to win, but defensively we couldn't get the stops and that's sort of been our story here. We are going to have to continue to work on our offence but get a lot better on defence." Nikola Goncin, form Regina, led Canada with 25 points, while Robert (Bo) Hedges of Fort St. John, B.C., added 10. Marcin Balcerowski led the way for Poland with 21 points on 75-per-cent shooting. Canada's women's team fell to 2-2 in pool play with one game remaining after a 64-52 defeat to the Dutch. After a strong start by Canada, the undefeated Netherlands side found its groove and Canada struggled to contain the formidable offensive duo of Mariska Beijer (36 points) and Bo Kramer (22 points). Arinn Young of Legal, Alta., was the top point producer for Canada with 21 points, followed by Cindy Ouellet of Quebec City with 18 points. "We have to do better at defence and take away their first threats," said Canada head coach Marc Antoine Ducharme. "We know Beijer and Kramer typically score 90 per cent of their points, so we have to stop them from shooting and keep them outside of the key. We can't just let her go inside and finish like she did today." The Canadian women, sitting in third place in their pool play their final round robin game on Wednesday against Brazil (0-4).